iLoveToCreate Blog: All about Dia de los Muertos! All about Dia de los Muertos! This week I'm kicking off my Dia de los Muertos project inspiration series! Dia de los Muertos is a 3,000 year-old holiday from Mexico that celebrates the lives of those who have passed on. Sometimes it is at the gravesite, other times it is at home in front of an altar or ofrenda that we build for them. 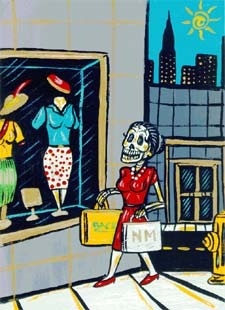 When you see the skeletons in my Crafty Chica product line, this is what they pertain to. They are always happy and vibrant to celebrate the cycle of life! CHECK BACK HERE EVERY DAY THIS WEEK FOR MORE PROJECT IDEAS! 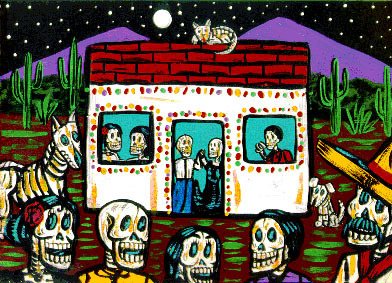 Dia de los Muertos takes place over three days. Each day of the celebration has specific activities associated with it. Artwork by my husband, Patrick Murillo. Infants and children who have died are angelitos, or "little angels." They follow the path of marigolds home, where their families have altars with pan de muertos, sweet tamales and sugar calaveras. The angelitos must be gone. The offerings at the altars are appointed for the "faithful dead" or adult souls with pan de muertos, tamales, mole, cigarettes and tequila. Mummers run around town wearing masks to chase the stubborn souls back to the land of the dead. 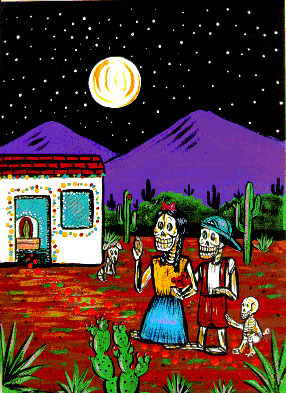 Within the next two weeks, I'll share ideas for making your own ofrenda to making crafts to display. You will rarely see a scary skeleton. Dia de los Muertos skeletons are most often jovial and happy. Their spirit is still alive, even though their bodies are not here. Not all ofrendas have to have skeletons, they can be any way you like. Building a memory shrine to a loved one is whatever you want it to be. Set out their favorite foods, drinks, hobbies, photos and more. 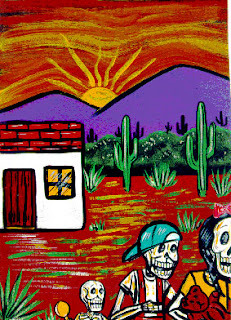 You'll see a lot of sugar skulls - my favorite! The colorful icing represents the sweetness of life. Here is the tag to see all the past projects and ideas. And stay tuned because I'll have new ones posted every day! Also, here are other helpful links from http://dead.azcentral.com, a site I helped put together!